Organized by PKSF, a 5-day training session took place from 14 to 18 November 2018 at Padakhep Institute of Development Management (PIDM), in Dhaka. The program, titled ‘Training on Nutrition’ was facilitated by Ms Pham Thi Hong, Executive Director, Center for Education and Community Development (CECD), Vietnam. The training program was designed and arranged to equip the Health Officers of ENRICH Program with better knowledge and skills on nutrition. Dr. Qazi Kholiquzzaman Ahmad, Chairman of PKSF inaugurated the training program as the Chief Guest on 14 November 2018. The Managing Director of PKSF Mr Md. 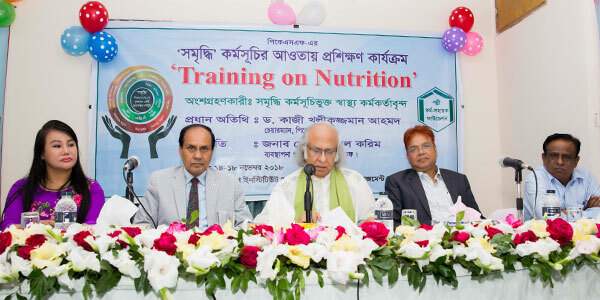 Abdul Karim presided over the inaugural session while Dr. Md. Jashim Uddin, Deputy Managing Director-2 of PKSF spoke as the Special Guest. Senior General Manager of PKSF Mr Mashiar Rahman and the Executive Director of Padakhep Manabik Unnayan Kendra were also present at the inauguration. The chairman of PKSF, in his speech highlighted the importance of nutrition for good health and well-being. 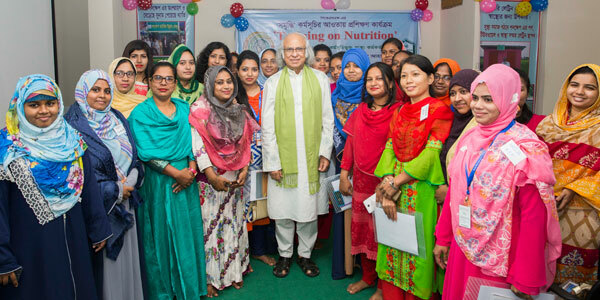 ‘Health and Nutrition’ is one of the major components of the ENRICH program. All Partner Organizations (POs) are relentlessly working to maintain good health of population in the 201 ENIRCH unions of 64 districts. Under ENRICH, total of 374 health officers, having 4-year diploma degree, work closely with the members of ENRICH program to better facilitate their access to medical and healthcare services. 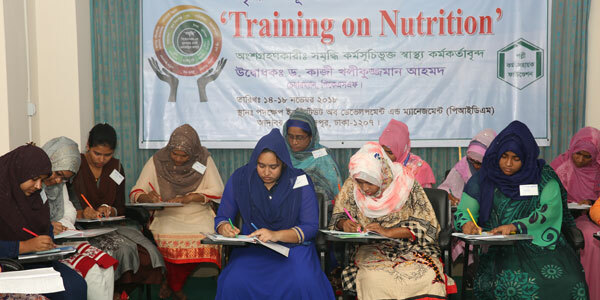 The training program was divided into 10 different sessions focusing on different areas of health and nutrition. Ms Hong discussed on the importance, sources and value of sundry nutrients in different sessions. 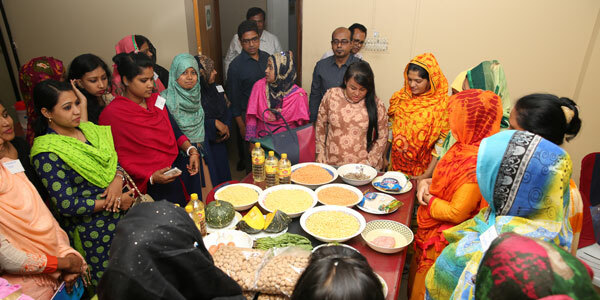 She also made the participants aware of some techniques of preparing balanced food for people of different age groups. 32 female participants from 32 POs took part in the training program. The participants will share their learnings and experiences with the health visitors working closely with them. The training concluded with a formal ceremony on 18 November at the same venue. It started with the welcome speech by Mr Md. Mashiar Rahman, Sr. General Manager (Program). Dr. Qazi Kholiquzzaman Ahmad, Chairman, PKSF spoke as the Chief Guest and handed over certificates to the participants. Mr Md. Fazlul Kader, Deputy Managing Director-1 and Dr. Md. 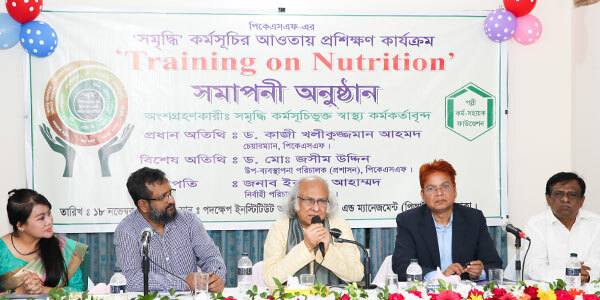 Jashim Uddin, Deputy Managing Director-2, PKSF also attended the session as special guests while Mr Iqbal Ahmed, Executive Director, Padakkhep Manobik Unnoyon Kendra presided over. Ms Pham Thi Hong presented on her evaluation regarding the training program.